A number of protective clothing articles should be worn when operating powerful machinery like chainsaws, including a helmet, goggles, ear defenders and work gloves. Something that can be forgotten from this list, though, is chainsaw chaps – protective trousers made from heavy-duty fabrics that resist against the impact of a running chainsaw. As you might imagine, normal fabric is no match for a machine that can cut through wood, so it’s imperative to wear chainsaw safety gear for the legs in case an accident should occur. View the Best Chainsaw Chaps, Below. How do Chainsaw Chaps Work? What do Chainsaw Chaps Do? How to Measure Chainsaw Chaps? To protect your legs when operating a chainsaw, high-quality safety logging chaps are a necessary investment. They are best described as ‘trouser shields’ and are worn over the user’s own trousers. Most offer extra protection only to the front of the legs, so wearers should be cautious that the back of the legs are still exposed to damage. We’ve compiled this guide of the 10 best chainsaw chaps available from Amazon, considering factors like comfort, safety and material. We hope you find the best solution for you from our in-depth chainsaw chaps reviews. This chainsaw safety gear produced by Husqvarna is made from PVC-coated polyester with extra protective layers of Tek warp. The aim of this material combination is to resist impact for long enough to reduce the severity of an injury and allow the wearer more reaction time. Unlike some other chaps, these also cover the lower backs of the legs for extra safety. The fabric is colored vibrant orange for extra visibility and the chaps also feature reflective strips around the ankles. They also include pockets, buckles for size adjustments, and are washable only with cold water to maintain the material’s integrity. See more information on Husqvarna 587160704 Technical. The Husqvarna chaps offer 360-degree protection of the lower legs, and the front of the thighs and waist. The clever material is layered to release ‘threads’ and clog the mechanism of a chainsaw if it contacts the fabric, helping to prevent serious leg injury. The Labonville Full-Wrap Chainsaw Chaps consist of 5-ply Kevlar layers with ankle wraps to offer premium safety and comfort. The chaps’ inner and outer shell is made from strong 1000-denier Cordura, and customers can choose between color choices of orange or green. As with all chaps, regular trousers must be worn underneath as this product is meant as an overlay. Additional features include a tool pouch, utility belt, and leg and waist buckles so that the sizing can be customized to perfectly fit the wearer. See more information on Labonville Full-Wrap. These chaps have gained great reviews from customers and it’s easy to see why. The protection offered by these Kevlar chaps is amazing value for money, though price should be no object where safety is concerned. The Forester Apron Chaps offer quality protection to the front of the legs, and Forester is quick to point out that this is the most commonly-injured area when using a chainsaw. However, this product is not suitable for use with electric chainsaws – these chaps do not offer the level of protection necessary when using power tools. The Apron Chaps come in three size options (35”, 37” and 40”) and seven color/pattern choices. They are adjustable to fit different leg sizes with two sets of buckles at the back and one set around the waist. See more information on Forester Chainsaw Apron Chaps. The strong material for such a low price is a massive advantage of these Kevlar chainsaw chaps. While they can’t be used with electric chainsaws, these are a great purchase for security when using less powerful machinery. The Makita chainsaw wood cutting chaps are recommended for use with gasoline-powered chainsaws. They come in one size – 38” – so may not be suitable for everyone, but for those that fit, this gear provides ample protection for the casual gas chainsaw user. Coming in bright orange fabric, they have five adjustment straps with strong buckles for a secure fit. On Makita’s own website, the company state that the material of the chaps is designed to assist in reducing severity of any injury incurred if a gas chainsaw should make contact with the leg, ‘under limited conditions.’ Buyers note that the chaps are lightweight and comfortable which makes the product great for carrying out light work in high temperatures. See more information on Makita 841008-A. These lightweight saw chaps give long-length protection for legs and boots when operating gas-powered chainsaws. They’re ideal for anyone looking for light protection when out working in the heat. These apron safety chaps come in a camouflage pattern for those who want to blend into the background and avoid being disturbed when working! Just like number 3 on our list, this pair of Forester apron chaps comes in three size options, and also feature three sets of adjustable straps so they can be fitted exactly to the wearer. As well as protection from chainsaw cuts, these chaps are resistant to water and oil, making them great for other kinds of work besides wood cutting. They feature ample pockets so workers can keep extra tools with them, and are a lightweight choice for working out in the heat. See more information on Forester Chainsaw Safety Camo. Like other Forester chainsaw chaps, this product offers exceptional protection when using less-powerful machines. However, wearers should be aware that the backs of their legs are exposed to damage and they should not be worn while operating electric chainsaws. This pair of Husqvarna chainsaw chaps are apron-style and are meant to be secured just under the waistline of the jeans/trousers worn underneath. With a secure waist strap and two sets of leg straps, the chaps can be fitted snugly to the front of the legs for great protection. These Husqvarna chaps aren’t designed to be worn when operating electric chainsaws – workers are advised to invest in stronger materials when using more powerful tools. However, Husqvarna is known for producing incredibly reliable chaps and these are no different. Like the first pair we reviewed, these contain the ‘threads’ within the fabric that jam the chainsaw’s mechanism if it comes into contact with the material, stopping the saw in its tracks. See more information on Husqvarna 531309565. These chaps contain the same great fabric technology as the Husqvarna 587160704 Technical pair – the only difference is that the 531309565s are slightly cheaper and don’t cover the wearer’s calves or backs of the thigh. Therefore if you don’t need protection from behind and need to save some cash, these are the perfect solution. Our third pair of Forester chaps, this time in a forest green fabric, are the same apron-style chaps as the pairs before. They’re lightweight yet provide heavy-duty protection against rotating chainsaws, and are constructed from water- and oil-deflective oxford outer fabric. 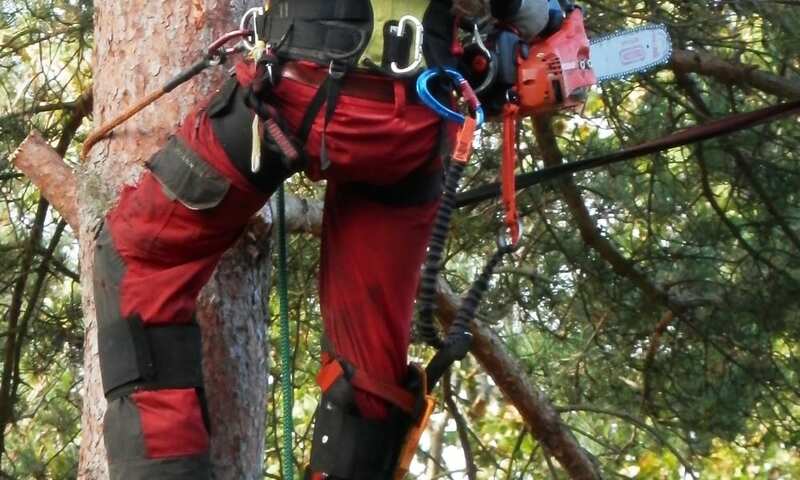 The adjustable waistline allows the chaps to fit the wearer securely, covering the front parts of the legs, especially the thighs, where chainsaw injuries are most likely to occur. These Forester chaps contain four layers of fabric, which makes them less heavy, but those looking for extra protection might want to opt for a Husqvarna five-layer pair. See more information on Forester Pocket Apron Style. Forester chaps are always great value for money, but these are a great deal for a four-ply pair with oil-resistant layers. They’re perfect for light protection, but workers using heavier machinery should look to thicker, wrap-around styles. The impressive blend of materials in these Husqvarna chaps make them look and sound like the best protection money can buy – and luckily you don’t have to spend much of it to get them. At a very competitive price for apron-style chaps, chainsaw operators will be hard-pressed to find a sturdier pair for under $100. Perhaps the only downside to this pair is that they don’t offer back-of-leg protection. Despite this, the front of the leg is shielded from serious injury by 600-denier polyester, protective Tek warp layers and PVC coating. They also feature tight adjustable straps and reflective strips. See more information on Husqvarna 587160702 Leg Wear. These chaps mean business – they’re doing their absolute best to make sure you don’t get slashed! The only downside here would be that they weigh 5lbs – hefty to lug around and sweaty to wear while working – but we’d rather be temporarily uncomfortable in return for dodging a hospital trip. Working in a busy area, near a road, or at night? These chaps are for you. Made from the same protective materials as the previous Forester chaps for chainsaws, these guys have the advantage of being ultra-high visibility in a bright shade of yellow with two reflective silver strips around each lower leg. This pair has an extremely impressive twelve layers of chainsaw protective material inside, as well as a 1200-denier outer layer that is also water- and oil-resistant. They come in three sizes but can be adjusted to fit just about anyone. 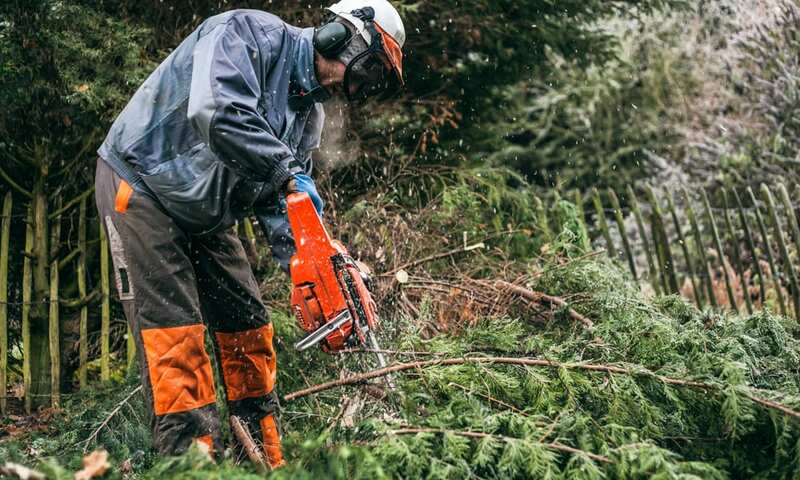 Again, they shouldn’t be used with electric chainsaws – but if you’re operating a gasoline-powered machine and need to make sure you’re seen while working, this pair is undoubtedly your best bet. See more information on Forester Safety Style. 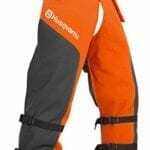 These Forester chainsaw chaps have layers upon layers of protection as well as a waterproof outer shell for working outside in all conditions. The high-vis color makes them perfect for working at night or near roads. The WoodlandPro apron-style chain saw safety chaps are available via Amazon in two sizes – 2X and RG – both of which can be adjusted to securely fit the wearer with straps and buckles. They’re made from nylon 400-denier fabric and a total of four material layers – two of polyester felt and two of Kevlar. They are designed for use with gas-powered chainsaws and the manufacturer warns that they won’t be able to stop the sprocket of an electric chainsaw. Like Husqvarna products, they’re designed to ‘pull apart’ and clog and stop the mechanism of a rotating chainsaw if it should contact the material. Once this happens, the chaps should be discarded and replaced. See more information on WoodlandPro Forest Green. These lightweight WoodlandPro Kevlar chaps are great for casual outdoor work in your backyard, but not for industrial wood-felling jobs. They’ll keep you cool in the heat whilst protected against small brushes with rotating machinery. We hope we’ve given you a better idea of what to look for when buying chainsaw logging chaps with these reviews of some of the best American brands. When operating heavy, dangerous machinery like chainsaws, it’s imperative that you do your research on how to keep yourself and others safe while working. Strong and well-maintained chainsaw chaps are just one item of safety gear that’s crucial to wear. Kevlar: Strong, heat-resistant fiber that was developed in 1965 and actually used as a steel alternative in racing tires. Nylon: Synthetic polymer that is malleable and stretchy. PVC: PVC coatings are a synthetic plastic layer mostly used to deflect water and oil. In general, the more layers contained in the fabric, the better. This gives the chaps better chance of clogging the chainsaw mechanism. The fit of the chaps is important. Apron-styles don’t protect the calves while wrap-arounds cover the thighs, shins and calves. However, full protection can be purchased in the form of safety chainsaw trousers, though these can get hot to wear, especially in the summer. Apron-style chaps were developed because they allow the wearer to stay cool through wearing just jeans/trousers at the back while still covering the parts of the leg most likely to be cut. Workers should be warned that operating heavy machinery while being extremely hot is a bad combination and could lead to fainting/slipping/other errors. All manufacturers are clear that when you are measured for protective chaps, you should measure from your waistline all the way down to your instep. This way the whole of your front is covered, and gives the added benefit of covering the tops of your shoes to ward off sawdust. When wearing, you should have jeans or other protective trousers on underneath. The straps should be adjusted to fit tightly – the gear should not be loose, as this could catch on the saw or other things around you. Always check that the safety gear you are buying is certified as fully protective by the relevant agencies. In this case, your chainsaw chaps should be UL certified and should meet the OSHA 1970 regulations. This means they have been rigorously tested for the quality of materials, that they’re fit for purpose, and the likelihood that they will protect you in an emergency situation. You will notice that the chaps on this list are not recommended for use with an electric chainsaw – the machinery in electric models works in an entirely different way, and will cut through chaps made only for gas-powered saws. The gear on this list is for gasoline-powered chainsaws only. If you plan on switching to an electric saw, don’t take your chances: buy the best chainsaw pants or chaps made explicitly for electric chainsaws. 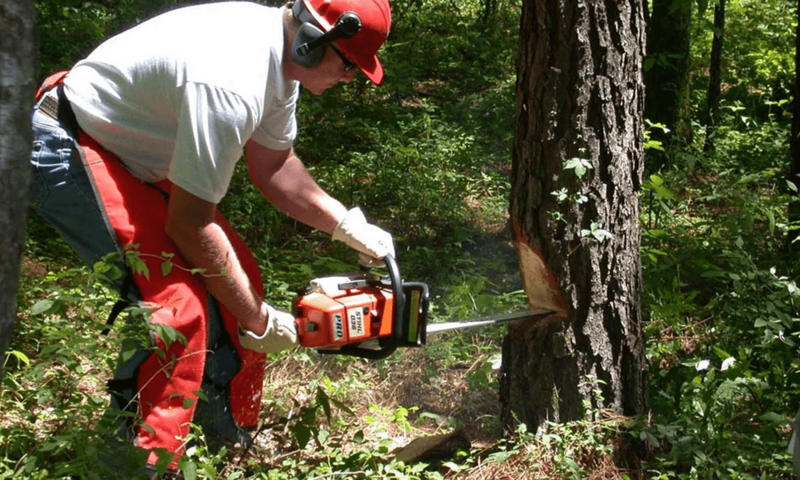 Chainsaw chaps work by containing layers of strong, protective fabric, like nylon and Kevlar, which bunch up and clog rotating chainsaws when contact is made between them. This prevents the machinery from cutting into the wearer’s leg, potentially averting life-changing injury or even death. Chainsaw chaps protect the wearer from serious harm. They should always be worn when operating a chainsaw, alongside other safety equipment like ear protectors and eye goggles. When measuring yourself for new chainsaw chaps, get somebody to measure from your waistline to your instep while you stand straight upright. Then, purchase a pair made especially for that size. This is important so that the chaps fit you snugly – chainsaw chaps should never be loose or too small. To adjust when wearing, pull all the straps so that they are comfortable but tight. Fasten securely with the buckles. If they do not fit, or the straps or buckles break, buy a new pair. Sure, it might cost a bit to get all your chainsaw safety equipment at first, but the cost of saving your life is worth every penny. Never underestimate the power of heavy machinery, and look out for yourself and those around you while using it. Protective chaps for chainsaws are as easy to get as pressing ‘pay’ on Amazon. All the products listed here are from reputable retailers and are proven to be effective in preventing potential disasters. Just read the comments on each listing to see reviews and photos from people who have dodged a serious injury by wearing them. If you plan on operating a power saw or indeed any tool, our advice is don’t until you have the right equipment. Your life could depend on it! As well as wearing high-quality protective chainsaw chaps, invest in a hard hat, chainsaw gloves, ear defenders, ear plugs, safety goggles, a protective jacket and special steel-toe boots made with extra protective fabric. Don’t scrimp on your safety! You must always buy a new pair of chainsaw chaps if you cut your current pair during use. Once the material is broken in any way, it will be ineffective at protecting you for the second time. We hope you enjoyed our article on "10 Best Chainsaw Chaps in 2019", if so, please share and rate it.